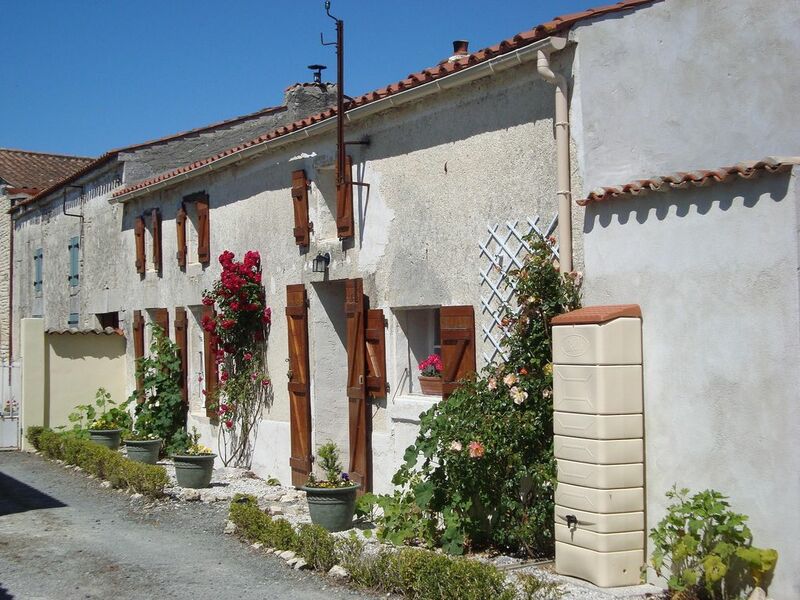 Beautifully Restored House 30 minutes from a long sandy beach and La Rochelle. Le Puits is a beautifully restored Charentais house, set in the Charente Maritime region (renowned for being the second most sunny part of France). The house can be found in Chambon, a typical French hamlet with beautiful areas for birdwatching, cycling and walking. The bakery delivers bread daily (not Wednesday) and the town of Surgeres, 5 miles to the east, has supermarkets, bars and restaurants, an indoor swimming pool and pretty river walks. Aigrefeuille d'Aunis, 5 miles to the west, has an outdoor market twice a week selling fresh fruit, vegetables and fish. It also has an outdoor swimming pool and a landscaped lake. Historic La Rochelle is only 25 mins drive away. Here you can sunbathe on the beach at Les Minimes, visit the aquarium or take the bus boat from Les Minimes to the beautiful harbour and enjoy the excellent sea food offered in the restaurants on the harbour front. La Rochelle airport has direct flights from the UK and Ireland with low budget airlines such as Ryan Air. I have lived and worked in England, Taiwan, Pakistan and Mexico but I still love France the most! Chambon, the location of my gite, provides a quiet and friendly hamlet in which I can work and relax. I have converted a local barn into a studio in which I make ceramic sculptures, vessels and bowls. I return to the UK frequently to deliver my artwork to galleries and to see my son and daughter. I am very lucky to be surrounded by such beautiful countryside with delicious wine, cheese and French bread only minutes away! Large shower room with wc. Separate shower room. Separate wc upstairs. En-suite wc bedroom 3. Large comfortable lounge with a three seater sofa and a two seater, dining table and chairs, tv (English freeview channels) and dvd player. There is a large original fireplace with log burning stove. Cooker, microwave, toaster, fridge freezer, dishwasher, washing machine. Golf de la Pree: 18 holes, 5931 m, Par 72, slope 136. Located 10 minutes north of La Rochelle (17), the course looks out to the Baie de l'Aiguillon and the Ile de Re. Restaurant and bar in the clubhouse.Tel: 05 46 01 24 42 Fax: 05 46 01 25 84.Golf de Saintonge Louis Rouyer-Guillet: 18 hole golf course located at Fontcouverte, Saintes (17) with pro shop and club house restaurant. Tel: 05 46 74 27 61 Fax: 05 46 90 54 11. Golf de Royan: Located at St Palais sur Mer, near to Royan (17), this 18 hole course has been carved out of the heart of the forest. Views through the trees to the Ocean.Tel: 05 46 23 16 24 Fax: 05 46 23 23 38. Golf d'Oleron: Flat links 9 hole course on the Atlantic coast situated south of Boyardville, 8 Kms from St Pierre d'Oleron (17). This is a flat links-type course which includes a large number of water hazards. 2908 m, Par 36.Tel: 05 46 47 11 59 Fax: 05 46 75 07 56. Golf du Pays Rochefortais: The 9 hole golf course lies midway between Rochefort and Fouras (17). Notes on accommodation: Sorry, no pets. The house has heating. The three bedrooms and lounge have radiators. The lounge and entrance room have original fireplaces with log burning stoves. Outside: The garden is well maintained and is a suntrap - perfect for sunbathing. There is a Weber barbecue and garden furniture. The parking area is located to the side of the house. Towels / Linen / Bed linen and white towels can be hired from the owner if required for a nominal fee per person. Other: Entrance room with breakfast table and chairs, and 2 comfortable chairs in front of an original fireplace with log burning stove. French windows lead into the garden. The property is spacious, well furnished and very comfortable. Lovely garden and barbeque area. Set in a peaceful village within 30 minutes of beautiful beaches. Nearest town Surgeres just 10 min car drive. Hazel is an excellent host, very welcoming and on hand for advice and support as required. Hazel made us very welcome from the moment we arrived. She was looking out for us and our arrival and tour of the house was perfect in every way. We had all the necessary explanations and Hazel helped us twice to get the TV programmes we were looking for. She was readily available during our stay and it was nice to chat from time to time. The house is well appointed and the kitchen equipment is good and complete. We enjoyed sitting out in the garden. The village is well situated for various places of interest, both well known but also some which lie off the beaten track. It is also nice to be able to get to the ile de Re in a short time. We were very satisfied with our stay due to the fine hospitality we received and the homely atmosphere of the gite. A well equipped property with all the modcons. Hazel is a most courteous and helpful host who provided us with good, useful local knowledge that gave our holiday a special boost. Her house is very well equipped, clean and with a small private garden, just perfect for eating outside. She even has games like chess available and lots of tourist leaflets too. We very much enjoyed our stay. Thank you for your review. It was lovely having you, your wife and daughter as my neighbours. You were perfect guests. We had a great time. Hazel was very welcoming and gave us lots of information about the surrounding area. We loved sitting by the old harbour at La Rochelle and enjoyed a day in Saintes. She recommended a local restaurant which was excellent. Watching the humming birds moths in the garden was fascinating. The weather reached 34 centigrade while we were there, so during this time we decided to stay in the shade between midday and 6pm. This enabled me to use up all my holiday reading and left me feeling very relaxed by the time we had to return to the UK. What a beautifully restored property. From the moment we arrived until the moment we left we were totally relaxed. If you really want to get away from it all for a break and without the tourist trappings, then this is the place to stay. Close enough to La Rochelle for a stunning town, beach, restaurants and shopping and an incredible sea life centre. The owner, Hazel, was incredibly accommodating and friendly with lots of local knowledge on must see places to visit or restaurants to eat at. We will certainly be back! Many thanks for your lovely review. I am so pleased you enjoyed your stay in Le Puits and appreciated its careful renovation. 30 minutes drive to a long sandy beach with sailing school, crazy golf and water park at Chatelaillon Plage. 25 minutes drive to the popular, sandy beach at Les Minimes in La Rochelle with rock pools and pretty park on the headland. There are reasonably priced direct flights to La Rochelle from London, Stansted and Dublin with Ryan Air; Southampton, Birmingham, Glasgow and Manchester with Flybe; Edinburgh and Leeds with Jet2; London, Gatwick and Bristol with Easyjet and Cork with AerArann. The gite is 1.5 hours motorway drive from Bordeaux airport. Europcar, Hertz or Budget can arrange hire cars from either airport.The ferry port of St Malo is a four-hour drive, and the Eurostar runs from St Pancras to La Rochelle/Surgeres. The town of Surgeres, 5 miles to the east, has supermarkets, bars and restaurants, an indoor swimming pool and pretty river walks. Aigrefeuille d'Aunis, 5 miles to the west, has an outdoor market twice a week selling fresh fruit, vegetables and fish. It also has an outdoor swimming pool and a landscaped lake. Historic La Rochelle is only 25 minutes drive away. The village of Chambon Bourg has an historic church and cemetery in which a number of French Resistance workers are buried. The separate village of Chambon-Gare, 2 miles to the south has a post office. Flat country lanes fan out from Chambon, providing quiet and safe walking and cycling routes. The tall hedgerows lining the lanes harbour many species of songbirds. Buzzards, harriers, kites and owls are frequent visitors. Deer and hares are also to be seen. One walk that we enjoy will take you through the avenue of trees in the grounds of the Maison de Repos (a convalescent home) at nearby Marlonges, then through the village of Marlonges and back home. During June and July many of the fields surrounding Chambon are full of sunflowers. A 25 minute drive west will take you to La Rochelle with its historic medieval towers guarding the entrance to the beautiful Old Port. The choice of excellent places to eat and drink is endless. Street entertainments around the harbour every night during the summer make for a pleasant after dinner stroll. At the nearby modern marina complex of Les Minimes can be found many museums and a small beach. The famous Aquarium is now located near the old port. Other beaches can be found to the south of La Rochelle at Chatelaillon Plage and Fouras, both of which are a similar journey time from the house. Booking Notes: 30% deposit at time of booking. Full amount payable 3 months before the holiday. Linen and towels Linen and white towels can be hired from the owner for a nominal fee per person. Changeover Day: The changeover date is flexible except for the months of July and August when the change over day is a Saturday. Departure time is 10am and arrival after 5pm.